One of Earth’s smallest creatures will boldly go where no earthling has gone before as scientists at the University of California, Santa Barbara, plan to send tardigrades to the closest star system, Alpha Centauri. This will make them, along with the nematode worm (Caenorhabditis elegans), the first interstellar species to travel across the great expanse. The Starlight program, which is part of the UC Santa Barbara Cosmology Group in Experimental Astrophysics, aims to use lasers to propel the tiny creatures in likewise tiny spacecrafts through deep space. In collaboration with the Department of Molecular and Cellular Development Biology at UC Santa Barbara, the scientists are currently researching how make the tardigrades and nematodes the first extrasolar travelers. Initiated in 2009 as a joint venture between UC Santa Barbara and the NASA Space Grant Consortium, the Starlight program is also known as both DEEP-IN (Directed Energy Propulsion for Interstellar Exploration) and DEIS (Directed Energy Interstellar Studies). It is a NASA program using large scale directed energy to propel small spacecraft to relativistic speeds, in the hopes of developing new technology that will eventually make interstellar travel possible. Graphic representation of a laser propelled sail. A. Mann/DEEP IN/University of California, Santa Barbara. Tardigrades and were selected for the mission due to their ability to survive intense environments, as they are likely to outlive anything and everything until our Sun swells into a red giant, and also because of their minute size. These water-dwelling, eight-legged, segmented micro-animals measure at only half a millimeter long when fully-grown. Also known as water bears, space bears or moss piglets, they can live through almost anything: capable of surviving both extreme heat and sub-freezing temperatures, pressures six times greater than those in the deepest ocean trenches, extraordinary amounts of radiation, and even the vacuum of space. A fictional “cousin” of the tardigrade is featured in the first season of “Star Trek: Discovery.” The not-so-tiny creature is just as tough, and is able to instantly travel the universe via the Mycelium spore network, conceptualized on the show as a microscopic web spanning the cosmos, an intergalactic ecosystem, or an infinite number of roads leading everywhere. Like science fiction, like science, tardigrades are a natural choice for Starlight’s dangerous mission. The Starlight team’s current research is looking for a way to safely store the tiny trekkers in a biological state known as anhydrobiosis — a dormant state that can occur in small invertebrates, such as tardigrades and nematodes, and some plant seeds. Induced by drought, the organism becomes almost completely dehydrated to reduce its metabolic activity to almost nothing. This strategy allows the creature to survive severe drought and extreme temperature conditions. The team wants to be able to wake up the passengers at specific points during the voyage for observation, in search of a better understanding how humans can later survive similar journeys across the stars. Launched in 1977, it took the Voyager 1 spacecraft 35 years to reach interstellar space, and it would take roughly 80,000 more years for it to reach the Alpha Centauri System, 4.2 light-years away. 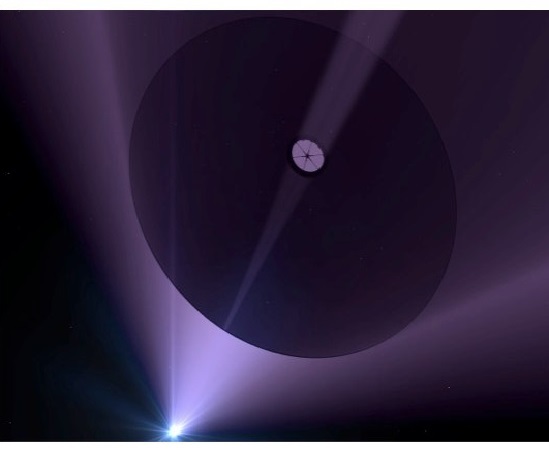 The Starlight program seeks to speed up the commute, using photonic (laser) propulsion to shorten the journey for their interstellar passengers to an estimate 24-year extrasolar trek.